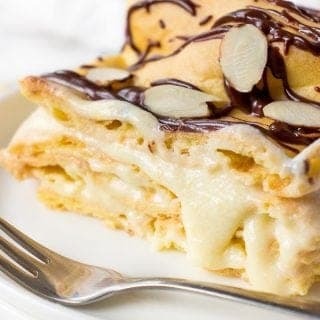 Scrumptious, melt-in-your mouth Chocolate Eclair Cake that takes traditional Eclairs to a whole new level. Made of beautiful Choux Pastry and vanilla pastry cream, this delicious layer cake is going to be your favorite treat for parties or other special occasions. In a medium saucepan combine milk and half portion of the sugar and bring everything to a low simmer. At the same time, in a medium bowl whisk together eggs, remaining sugar and corn starch. When milk starts to simmer, pour 1 ladle of it into the egg and corn starch mixture and whisk constantly until no lumps remain. Add the remaining milk, whisk until smooth and transfer everything back into the saucepan. Bring to a low boil and cook for one minute. Remove custard from the heat, transfer to the heatproof bowl, cover with a food film and place on a counter to cool off completely. In a large bowl beat the butter with vanilla. Fold cooled custard into the butter and mix until cream is smooth. Refrigerate while you work with the rest of the ingredients. In a medium pot combine water, butter, sugar and salt and bring everything to a boil. Add flour and using a wooden spoon whisk vigorously until no lumps remain. Work the dough until a thin film forms at the bottom of the pot. Whisk in the first egg and mix with a wooden spoon until the egg is fully incorporated into the dough with no white lumps. Continue whisking in the remaining eggs, one at a time until your Choux Pastry is smooth and elastic. With wet hands arrange half of the dough on the baking sheet and smooth it out. You might need to wet your hands a few times as the dough is a bit sticky. Bake for 15 minutes. Without opening the door, reduce the temperature to 320 F and continue baking for 18-20 minutes until top is slightly golden brown. Don’t open the door during baking as the dough won’t rise. Remove from the oven, slide Choux Pastry on a clean kitchen towel and arrange the remaining dough on a baking sheet. Arrange baked layers of Choux Pastry one on top of the other and cut in half crosswise. Liberally spread 1/3 of pastry cream over the first layer of Choux Pastry. Repeat layers. Top with the remaining cake layer. Place chocolate chips and cream in a microwave-safe dish and heat in 10 seconds intervals until chocolate melts. Whisk until smooth. Dip fork into the chocolate and drizzle it over the cake. Sprinkle with sliced almonds and serve! To keep parchment paper in place while you arrange the dough, spoon small dots of dough into each corner of the baking sheet and lightly press parchment paper against the dots.